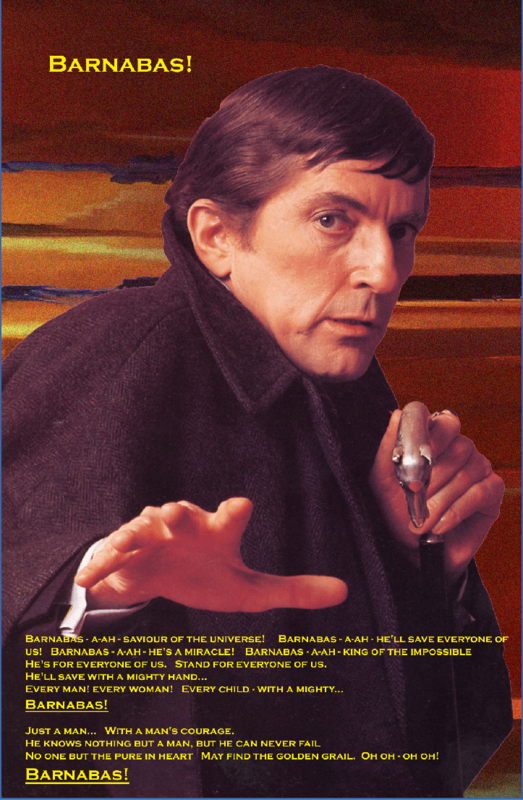 I long for the alternate universe in which Dino de Laurentis made a Dark Shadows movie in 1979 with music by Queen. With toys. And posters. Like this one. Talk about Parallel Time. Get me to that room! From the Alan Dean Foster novelization…. “We certainly invite you all to stay,” Prince Baron proffered. “What do you think?” asked Barnabas, only thinking of her needs, not his own. The offer was appealing. For about two seconds. “I’m a Collinsport girl. It’s a little too quiet around here for me,” Maggie replied with a grin. And then the Hawkmen fly in formation to spell out a “Thanks, Barnabas,” that gets horribly butchered for years in pan-and-scan VHS releases. Brian Blessed as Dr. Brampton Stokes, from the English branch of the Stokes line. Ritz as Smiley Loomis, his assistant. It’s all fitting together. I dunno. I may need to shift this to DarkShadowsTNG. Hey, we all can dream of a good DS reboot.. In the one I am developing, Carolyn, in full ninja gear meets with Barnabas and Maggie about breaking into Tony Peterson’s office to retrieve Joe Haskell’s notebook (Joe Haskell being under indictment with Peterson as his lawyer). Carolyn is all ready to scale the exterior walls with her equipment when Maggie tells her that Barnbas will jus materialize inside, hypnotize the guard (“these are not the droids you are looking for”) and let hem in “You area no fun, Cousin Barnabas” Carolyn laments. They get in, but they find that instead of the notebook Peterson has left blank paper, in which he says that he has a proposition for them if Carolyn meets him for lunch at the cafe…. Peterson says that his price is 1) help Joe beat the rap and 2) that Carolyn goes to work for him, so taht she can do all her nifty ninja stuff instead of posing as the proper, prim young woman she is asked to be. Carolyn agrees enthusisticallly and the two embrace passionately.